Every month, we tell you which Latin American writings we are reading. Taking many different forms and featuring writers stretching the whole of the South, Central and North America, we bring to you a wide selection of the modern works that are stirring literary interests. This month, Theatre Editor Helen Brown is taken with Emma Reyes’ autobiographical tales. 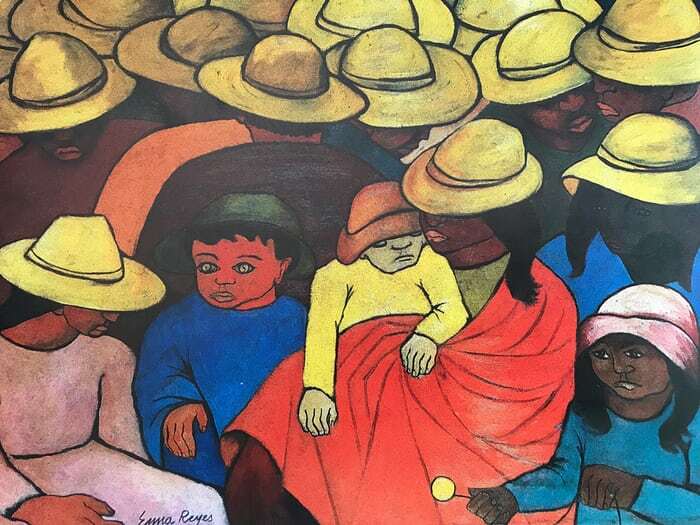 Emma Reyes was a Colombian painter who created vibrant primitivist paintings of loosely drawn, densely patterned faces looming through a braid of bright colours. Her paintings, much like her memoir, are childish: the colours are a few shades brighter than in real life, and the facial features curved and hooked together as though drawn by the relaxed hand of an infant. Emma Reyes died in Paris in 2003 aged 84, after establishing herself as an artist and befriending an impressive array of Latin American and European cultural elites, such as Frida Kahlo, Diego Rivera and Jean-Paul Sartre. Her memoir, however, tells not of her life as an expat, but of her childhood and adolescence, a tale of extreme poverty and unimaginable cruelty, told with a dynamic energy and detail reminiscent of her luminous paintings. The book is comprised of a series of 23 letters that Reyes wrote to her friend, Colombian art critic Germán Arciniegas, who urged her to write down the incredible stories she told about her life. The letters are not evenly spaced, and there is a twenty-year gap after the penultimate letter, due to a rift between the pair because Arciniegas showed her letters to Gabriel García Márquez. Emma saw this as a betrayal, despite receiving a call from Márquez filled with effusive praise. The book is hinged around three main events: her mother abandoning Emma and her sister Helena at a train station; their entry into a convent, where they clean and embroider cloths and learn to fear the devil; and Emma’s escape from the convent aged nineteen, which forms the ending of the book. Emma was illiterate until her late teens, yet her prose is disarmingly beautiful, poignant and funny. In her letters, every word is carefully placed, and she sometimes protests to Arciniegas: “you make no corrections, and I don’t even know if what I’m writing is comprehensible.” Despite her skepticism, her writing is descriptive and exciting, as she portrays her discoveries of the world through the fresh eyes of herself as a child. In one letter, she describes seeing a monster during a celebration in her town: “its enormous, wide-open eyes were yellowish and so bright they lit up half the plaza. People fell to their knees and began to pray and make the sign of the cross…some men advanced toward the square with large sticks in their hands. The beast stopped in the middle of the street and closed its eyes. The first automobile had arrived in Guateque.” The suspense she crafts makes the passage read like a fiction novel, which is immediately interrupted when the letter ends with an abrupt reminder of reality: “Tonight the first human landed on the moon. Kisses.” She writes the perceptions of her infantile self with such fluidity that the arrival of adult Emma is disarming, as if showing herself as the hand behind the puppet, engineering her own story. Emma also writes about the privations and hardships she suffered as a child with a detached objectivity, that often has political implications. Without explicitly saying so, Emma’s memoirs point to the relationships her mother had as a mistress, with two politicians; they fathered Emma’s two half-brothers. The first, Eduardo, is taken from the family so as not to reveal his father’s secret as he ascends the political ladder. Emma frankly describes the mistreatment of the second baby boy: “just like the pig, who was mine, whom no one looked after, I had the impression that no one took care of the Boy either, and that he was mine alone.” Emma’s life story is testament to the domino effect of apathy: her mother’s children, discarded by their fathers and mother alike, are eventually deserted. When Emma and her sister arrive at the convent after being abandoned, Helena warns her not to talk about their mother again. Emma describes how “that silence lasted twenty years; neither in public nor in private did I ever say her name again, or speak of the years we’d spent with her.” Reading Emma’s unflinching account of these devastating events makes a reader feel honoured to be privy to such heart-wrenching revelations, which were kept buried for so long. The importance Emma places on storytelling and its ability to soften the hardships of life is reflected in the entire book, wherein Emma tells her life story peppered with tangential tales which she resourcefully held close to her so as to nurture her imagination. She curates the two together and offers them to the reader, all of them precious and gripping.